Painting Lift Interiors Poole. A Case Study by Vanda Coatings. Painting Lift Interiors in Poole. Vanda Coatings usually work on commercial projects, but occasionally our operatives re-spray architectural metalwork in a residential setting such as painting lift interiors in Poole. Specifically, in the case of Pelican House, the inside of 2 lifts servicing a block of residential apartments needed recoating. Sometimes access is an issue for our sprayers. Either the work is at height and / or parking may be difficult. Pelican House had an underground car park with plenty of space, so our Vanda team re-painted the lifts while they were static on the basement floor and used the hallway in the basement to work. The residents’ representative let our team in, so preparation could begin on the 2 sides and back of each lift. The two lifts were completed one at a time and residents used the stairs while they were out of action. The first thing to be done was to mask up the inside of each lift as shown in the photos below left. 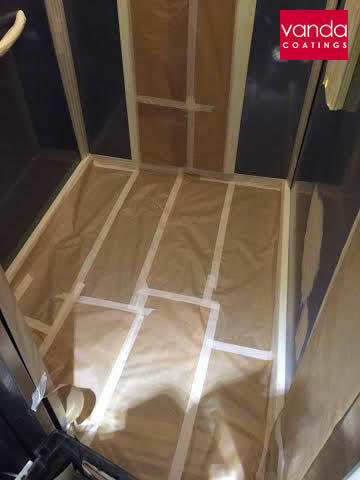 This entailed covering the mirror, control panel with buttons, floor, ceilings and doors with brown paper or plastic and securing the masking with tape. The smoke alarms were also covered up apart from the ones inside each lift shaft as they couldn’t be reached, but this didn’t pose a problem as they were far away enough to be unaffected by any possible overspray. The original coating was a metallic blue and was scratched and dented. Consequently, our Vanda Coatings team leader decided to use filler to smooth out the cavities seen in the photo below on the right. So that the surface would be even and without any ridges, the operatives rubbed down the filler with 80 grit wet and dry sandpaper using a sanding block. They then went over it with 180 wet and dry followed by 240 grit in order to remove the rough scratches that were put in when the initial 80 grit paper was used. A certain level of roughness helps coatings adhere to substrates, but if the surface is too coarse the finish won’t look as good. A superior finish is vital when painting lift interiors. The next step was to prime the metal before recoating could begin. Sometimes primer reacts with old paint, but it is difficult to predict when this will happen because it is not always obvious exactly what coating has been used originally. It is often simply a case of trial and error. Our team leader primed a sample area and found that the primer bubbled up as it started to react with the previous layer of paint. The sprayers dried off this pickled paint with an infra-red glow lamp and sanded it down smoothly again to take the pickling away in the sample area. They then barcoated the whole of the inside of each lift and let that dry for half an hour before painting lift interiors in Poole. The blue top coat used was a specialist paint formulated for metal and this was applied electrostatically. In just one day, the lift interiors were transformed and they looked as good as new as can be seen in the top photo and bottom right.